Portugal. In the early Neolithic Era, in what is now the town of Almendres, somebody lugged multiple boulders to a hillside and set them in formation. These stones were 6-8 feet tall and placed in a symmetrical pattern on the length of a hill. Some had symbols (a crook, crescent or face) sculpted onto flattened surfaces of their eastern sides. At the bottom of the hill, sit two stones twice the size of those higher on the hill. At a nearby site, sits the sad remains of a late Neolithic Era grave. It is a dolman (a rock grave site that would have been buried so that it showed only as a mound rising from the ground but we saw it unearthed). Mario explained that in 1964, an archeologist had blasted it open and then removed the roof so that it is progressively deteriorating. A narrow roof above it actually hastens its demise as the rain runs off to create gutters around the stone structure, thus threatening its stability. Mario commented that comparing the early Neolithic Era to the late Neolithic Era is like comparing ancient Rome to modern day. I liked that analogy. These sites are both on private land so they aren’t eligible for Unesco designation. 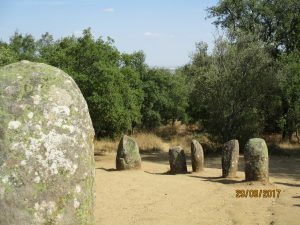 Both these archeological sites are in the midst of the Alejente Region’s biggest cork oak forest. 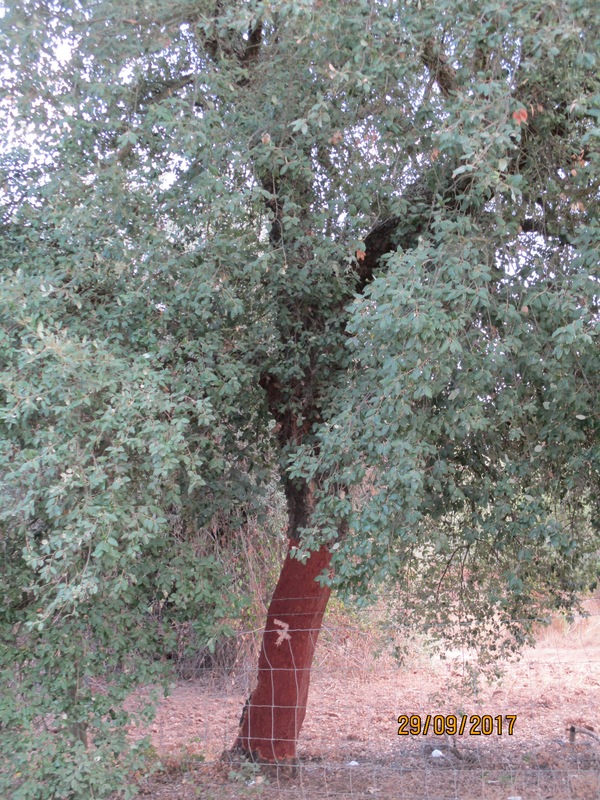 You want the vegetation kept low to decrease risk of fire for these lucrative trees. Traditionally, sheep and goats kept the vegetation low around the trees but now cows are on duty. It takes 30 years to get cork of good quality and then, you only peel the cork bark at 9-year intervals. They say: You plant vineyards for yourself, olive trees for your children, and cork trees for your grandchildren. I wonder how people in the early Neolithic Era may have used cork.